Reddit had a 6 hour downtime that was caused by them running a database backed by Amazon's cloud disk storage product (EBS Elastic Block Store), but EBS is both unreliable and doesn't flush writes to disk when told to. This led to corrupted data and disagreements between the master database and slave databases, causing the slaves to not be usable while the master was down. Modern SQL databases are not written to work right on hardware that does not have a reliable flush to disk operation. Correct functioning of a modern database absolutely requires that "write back" caching can be shut off, so that if a disk reports a write succeeded that the write actually succeeded. See for example http://www.postgresql.org/docs/current/static/wal-reliability.html ; this is not at all unique to postgres, I believe that every sql database requires committed writes to actually commit to disk. The law of leaky abstractions says that as we virtualize more we can do things that appear to work but don't really actually truly work exactly how we think they do, and Murphy says it will hit us with public downtime. Row ID #770 - Bob submits article about puppies. Master says it commits, so data is sent to slaves. Master lied, data was actually in a cache somewhere, write later actually fails in the master - but succeeded in the slaves. Row ID #770 - John submits article about kittens. Master now has kittens, slaves have puppies, dogs and cats living together mass hysteria reddit is down for 6 hours migrating master data to new hardware and manually hacking up rebuilt slave tables. I don't know how this works with nosql systems and eventual consistency. Is cassandra ok to run on ebs disks but postgres not at all? Reddit says their solution is they are going to move to using local ec2 disks; is that actually a solution, or does it just make hitting the problem less likely because ec2 local disks are more reliable than ebs? Do they still do write back caching? The upshot is, scaling by working in the cloud leads to a whole new set of challenges. You have to invest more in writing your software to handle hardware failure, you have to test failure scenarios more, you may have to go so far as to redesign network protocols to be less chatty because you have unpredictable latency from shared systems, and you have to expect problems from when abstractions leak as layers of complexity are added to what used to be a simple operation like “write this to disk”. If you’re at the point where your hardware costs from scaling exceed your software development costs, or if you truly need to be able to handle rapid customer growth faster than you can expand traditional data center use, it can make a lot of sense to tackle these challenges. But it’s not a no-brainer no-effort proposition – development and testing are going to get harder to handle new scenarios as you switch to using a larger quantity of less reliable resources. Netflix uses simpledb, hadoop, and cassandra. The DNN Event Viewer first runs a purge sproc, then runs a get log sproc. If you have a lot of events, the purge sproc is almost certain to time out. The get log sproc can benefit from a nolock. But the purge sproc is where we saw most of our trouble. This was failing for a few clients of ours. They would end up with say 65k records in the event log table, and this would never complete. I haven’t found a tool that I love that parses Event Viewer well. What I do these days I use psloglist from Windows SysInternals to dump the log to a tab delimited file, then I hack on strings in Excel using IFERROR, SEARCH, RIGHT and LEFT to get decently representative strings and then sort and subtotal. I test out xpath using Xpath Visualizer. SOAP – send everything as an HTTP POST. HTTP is being used mainly to dodge firewalls and not really providing any benefit. Protocol was intentionally designed to be too complex for humans, leading to dependence on tools. REST – use verbs applied to nouns. HTTP has other useful verbs besides GET and POST. a) PUT is indempotent. Repeating the same operation should get the same result. Side effects are allowed, but the side effects should be the same for repeated requests. POST is not indempotent. Repeating the same operation may yield different results. b) PUT contains the actual item for a specified resource. POST provides an item for the specified resource to work with. For a practical example, POST would be used to tell an account to add a new note to it, while PUT would be used to edit the contents of a note. PUT can’t do an “append” operation, if you POST your ‘add a note’ twice you have two notes, if you PUT the same note twice you just have the one note in the end. I think it’s really important to consider both of these things together – the side effects are different, and the entity you specify are different – PUT says “this resource is this data”. POST says “this resource should work with this data”. 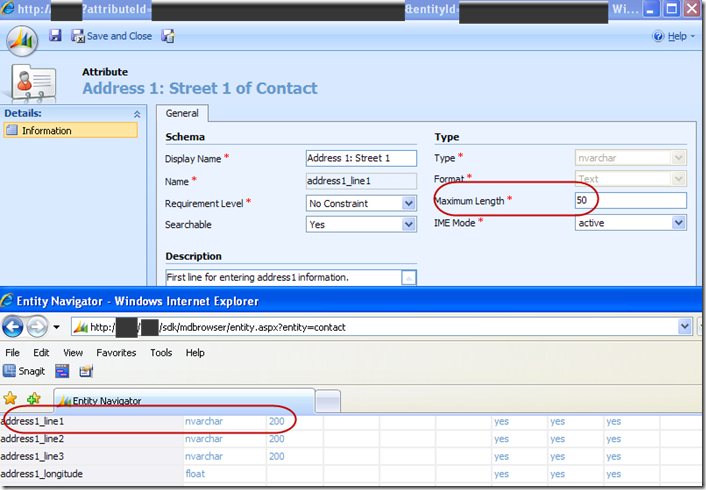 CRM has this nice entity browser that is supposed to show you info about your entities, like what fields there are and how long they can be. You go to your server and add /sdk/list.aspx to the url and it shows you what entitites you have and what their attributes are. I used to rely on it because as a programmer, it’s the quickest/most convenient way to get the length information and the ‘valid for update’ information about fields. Unfortunately, it’s apparently unreliable. 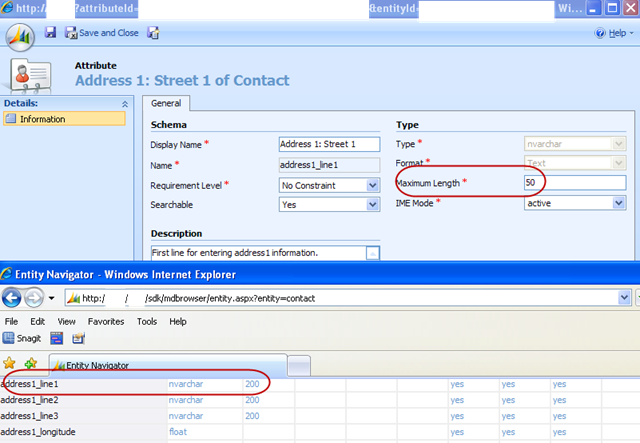 The below screenshot is from a client site. They only have 1 CRM organization configured, yes I’m pointing to the right server on both, and yes their contact is published. But the entity browser does not show that the fields have had their sizes reduced (to better fit on mailing labels), and if I relied on this to write my code for working with addresses, I’d get it all wrong.